Every day that we get to learn a little bit more about the elusive Daniel Day-Lewis is a gift. Remember that time he admitted his love of reality TV? How did you feel when he half-explained why he was quitting acting? Where were you and what exactly were you doing when you first saw his surprisingly tatted-up arms reaching for a playful pup in that iconic W magazine shoot? This week was a gift. 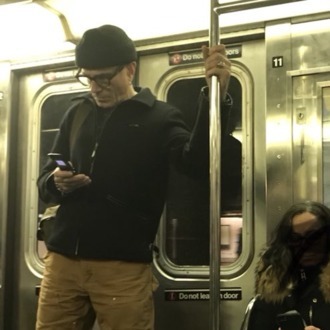 Early Thursday evening, writer Karen Han announced that she was in the presence of Day-Lewis in a totally nonchalant tweet: “daniel day-lewis is on my train and casually just looking at his flip phone.” The good people demanded to know more, which is when we received this: a photo of Day-Lewis, using what appears to be a [squints at photo] Motorola Razr while riding the New York City’s MTA. He must’ve been extremely cool in 2005! Just one question, Day-Lewis: Who do you trust to fix our failing subway system?